The Aruba.it Racing - Ducati team is ready to resume competition at Imola (Italy), which this weekend will host the fifth round of the 2018 WorldSBK Championship, a "home race" for the squad given its proximity with Borgo Panigale's headquarters as well as the massive presence of Ducati fans. 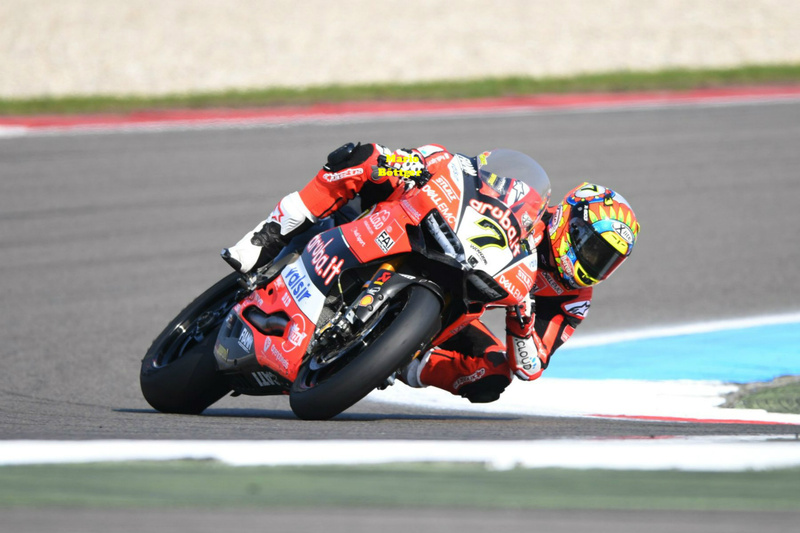 The track titled to Enzo and Dino Ferrari triggers many a good memories for the team, which took two doubles in the past couple of seasons with Chaz Davies, and the goal is to extend the positive streak. Davies, second in the championship with 129 points, took six overall podiums (with four wins) at Imola in his WorldSBK career and is as determined as ever to confirm his competitiveness and close the gap from the top of the rankings, which consists currently of 30 points. Marco Melandri, who took his first WorldSBK podium at Imola last year, is eager to further rewrite his personal stats there, also given the steps forward made during the Brno (Czech Republic) test, and narrow the rankings where he currently sits in third position with 115 points. To complete the roster, rookie Michael Ruben Rinaldi is also keen to continue his growth process with the Aruba.it Racing - Junior Team on a circuit that suits his riding style and where he has already won last year in the Superstock 1000 class. The Aruba.it Racing - Ducati team and the Aruba.it Racing - Junior Team will resume action on May 11th at 09:45 for the first free-practice session. "Imola is a special place. We've been particularly competitive there in the past two years, even going above our expectations, and it's just been one of those circuits where we've been able to get into a good rhythm quite fast. The track itself has some hard-braking areas that suit my style, and I've always been very motivated since we've been surrounded by all the Ducati people and fans, who have so much passion. But nothing stands still in racing, so we need to keep our head down and be prepared for a battle, as always." "I think we're heading to Imola at the right time, I'm very excited but also focused and full of energy. I still haven't won at Imola in WorldSBK, but each year is a different story and I'm confident we can be protagonists. The last test has given me a lot of confidence, we made a big step forward and we understood our limitations better. I'm as determined as ever to fight for the win again. Anything is still possible, but we must not waste any opportunities. It'll be a memorable round!" "We head to Imola with more experience under our belts, I'm in great shape and eager to keep improving. The Brno test gave us another chance to better adapt to the bike, and personally I really enjoy riding at Imola. I'm confident we can do really well there and aim at a top-five finish, which is not an easy goal but still within our possibilities. Looking at past results, the Panigale R has done really well at Imola, so we just need to head out there and see where we're at."